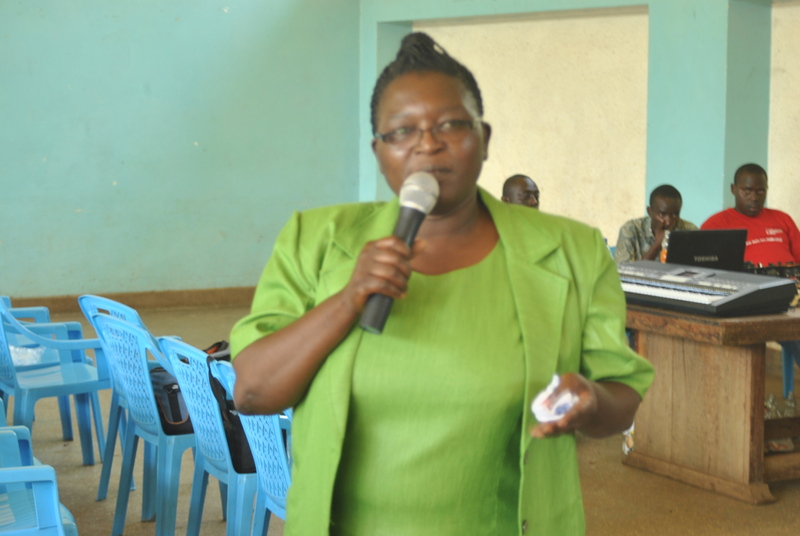 KISUMU County Commissioner Lorna Odero has today directed the district commissioners to crack down drug and illicit brew peddlers in the county. Odero asked the DCs to make their areas drug free and warn of any laxity to arrest those involved. She also orders the police in the county to ensure thorough inspections of public vehicles and suspected cars that are used to ferry the drugs and alcohol. “I have instructed all the security agents in the county to deal strictly with cases of drugs,” she said. Odero also warned those chiefs alleged to be colluding with changaa brewers and remind them of their responsibilities. The county boss said the county recorded high usage of alcohol and drugs nationally and called all the chiefs to apprehend all the dealers. Odero also warned the DCs and chiefs who are reluctant in fighting the drug peddlers in their areas saying they risk loosing their jobs. “We cannot sit back and watch our youths being rendered useless by people with vested interest,” Odero stated. She further asked young people in the county to desist from drugs and engage in productive activities. The administrator urged members of the public to be vigilant and volunteer information to police to apprehend those involved in drugs. This comes just a day when Kisumu West DC, Gilbert Kittyo impounded over 700 litres of illicit brew in Sunga village. The brew included changaa and molasses which they poured down and intercepted the equipment that they use in brewing. Kittyo warned the chiefs in his area that they will face stern action if they fail to eradicate the drug menace. “I will sack those chiefs who fail to perform their duties before I am sent packing by my bosses,” he warned. Members of Kisumu County Assembly have approved 10 executive cabinet nominees for the appointment by the Governor Jack Ranguma. The members adopted the vetting report table before the assembly by the Leader of Majority Samuel Ong’ou after the Speaker Mrs. Anne Adul revoked Standing Order No. 60 following a stand-off among the members. This was after members could not come to the agreement over the standing order for adopting the report tabled. The cabinet nominees who underwent vetting by the county vetting committee chaired by the speaker of the County Assembly had earlier found two nominees unsuitable to hold the dockets. Mohammed Hannif Rana and George Okoth who were nominated for industrialization, Enterprise and Transport and Information, Communication and Planning Development were found unsuitable by the vetting panel over their capability. However the two have the members of the assembly to thank for after they went for voting through division method. Despite section of the members raised concern over regional balance and exclusion of people living with disability the nominees report was overwhelming passed 100 percent. The County Assembly has 35 ward representatives exclusion of 9 nominated members whose fate still lies in the court. According to report tabled before the house gender balance was not well observed as per the vetting committee. The cabinet nominees approved for appointment in various dockets include Joseph Okal (Treasury), Dr. Barack Abonyo (Water, Energy and Natural Resources) Dr. Rose Omondi Kisia (Commerce, Tourism and Heritage, Roda Aonobadha (Environment Management), Elizabeth Ogaja (Health Services) Dr Stephene Orot ( Agriculture, Livestock and Fisheries). Other nominees are Jenifer Okere (Education, Youth, Culture and Social Services), Eng Vincet Kodera physical planning roads and public works, George Okoth Communication Planning and Development), and Hanif Rana ( Industrialization, Enterprise and Transport Development). Margrate Mbuya was also approved to be appointed to County Assembly Service Board. However, the speaker directed the vetting panel to submit the adoption report of nominees to the Governor appropriately and immediately for appointment. 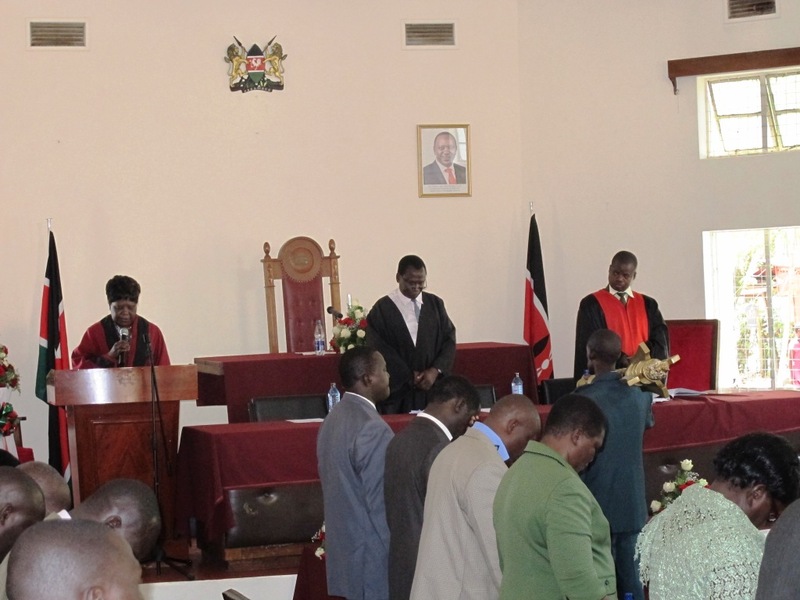 Kisumu Law Court has upheld the petition challenging the election of Kisumu West Member of Parliament Olago Aluoch following his prayer for the dismissal of the case citing delays of bond payment by the petitioner. Justice Hillary Chemitei dismissed the request on the ground that the petitioner Rosa Buyu made the payment within the stipulated time. The Judge said April 19, 2013 being the last day to remit payment the petitioner did not breach the law as claimed by the respondent. Olago had earlier argued that the petitioner Buyu represented by lawyers Stephene Mwanesi and Millicent Ogutu deposited the checks late. Because April 19, 2013 fall on Friday he argued that technically the cheque will take three days to mature. Buyu presented 2 bankers cheque of Ksh. 250,000 as the security for case challenging the election of Olago. An affidavit by Buyu through her lawyer Millicent Ogutu states that the deposit was made on April 19, 2013 in line with Election Act. The Act states that payment for the bond should be made within ten days this therefore Justice Chemitei find it necessary for the case to proceed. However, Independent Electoral and Boundaries Commission (IEBC) lawyer Jude Ragot seek for judge’s permission for application in the Court of Appeal to challenge the ruling on payment of the bond by the petitioner. The application was also requested by Olago. Chemitei allowed the request by the respondents saying the petition has to proceed citing that the cases has to be concluded within 6 months as by the Election Act. Buyu through her lawyer Mwanesi supported the prayer by respondents saying the case will proceed until the Court of Appeal will issue an order to stop the case. Kisumu County Elders Forum has back the executive cabinet nominees saying the nomination have invariably reflected and represented the faces of the entire County. The Forum Chairman Walter Adel Kitoto said the nominated candidates have the academic qualifications and technical skills required to implement the county’s development agenda. “The nominees have wide, long and solid working experiences and commitment in their respective dockets,” said Kitoto. The elders also added that nomination has gender parity and professionalism as required by the constitution. The elders called upon the Nyando MP to toe the County’s development dream and further urged the County Ward Representatives to vet and approve the County executive nominees to enable the Governor Ranguma to spur development with speed and accuracy. However they challenged the nominees to desist from politics and drive the county’s economy forward saying the residents wants service delivery. “We are tired of politics that keeps on driving our economy backward. It is high time that we should shun our self-interest for the benefit of our county government,” they said. This comes barely a week after Nyando MP Fred Outa criticized the County Cabinet nominees of being unrealistic and lacking constructive quality for rapid development and political unity. Governor Jack Ranguma last week unveils his 10 member executive cabinets from Nyando, Muhoroni, Seme, Kisumu Central, Kisumu Town East, Nyakach and Kisumu West constituencies. He also nominated two special directors to drive the renewable energy and land issues in the county. Youths in Kisumu County have been told to desist from drug abuse and engage in productive activities that will change their lives. National Authority for the Campaign against Alcohol and Drug (NACADA) Nyanza Regional Manager Esther Salim Okenye said there is high rate of drug abuse in the six counties. Okenye urged youths to go for loans to start-up small business saying the government is set to allocate funds to empower them in a bid to curb the rampant vice of dependency in the societies. The National statistics of drug and alcohol abuse stands at 13 % meaning in every 100 people 13 are involved in drugs abuse. “This is high rate that call for immediate address by all stakeholders,” Okenye said. She stated there is need for more sensitization of youths on drug and alcohol abuse adding that people between the age of 15- 65 are involved in drugs. Okenye adds that in Nyanza, alcohol and bhang is the mostly abused by people especially youths. “We are second in bhang abuse after Western region,” she revealed. In curbing the misuse of drugs NACADA has now embark on awareness creation through competition such as choir, music and ball games to bring youths together in all the 47 counties. Okenye said the authority is currently undertaking various competition targeting youths in Siaya, Kisumu, Nyamira, Migori, Kisii and Nyamira Counties with winners proceeding to perform at national level. She made remarks during Kisumu County Choir Competition on Alcohol and Drug Abuse held at Social hold where over 200 youths attended. During the competition Ngege Youth Group Choir emerged the winner with Kobala Youth Group from Homabay County in second position. The two groups will represent their counties at regional level before proceeding to national level. A middle-aged man posing to be a criminal investigation officer succumbed in his destiny after he attempted to exchange bullets with armed security perssonel in Bungoma. Bungoma south deputy police chief Mutume Maweu said the man has been in the recent past masquerading as a police office officer where he used the rank to obtain money cash from unsuspected residents and terrorising locals. Popular known as Symo, police sources said that he stole the pistol from an administration police after involving in a road accident at Sikata centre along Bungoma-webuye highway. The impostor was shot to dead with police from Bungoma as he tried to escape.The incident comes at a time when insecurity in Bungoma county has skyrocketed with unknown assailants attacking villagers. Meanwhile four people are nursing injuries after armed gangs with pangas attacked Bungoma surbubs leaving locals in shock.As the police continues to grill suspected people alleged to be behind the spate,former youth leader Augustine Mayavi has been grilled and an officer from ministry of lands. Police sources says that investigation is on for his accomplice where they will help the officer gather reliable information concerning the security.